In case you weren't able to watch the New Year light show at Burj Khalifa on December 31, and also missed watching it during the extended one-week period, now is the chance to head to the Dubai Mall, sit by the fountains, and enjoy the show. Burj Khalifa has announced that visitors can now enjoy the light show until March 31. On Tuesdays, Wednesdays and Saturdays, visitors can watch the show at 8pm, and at 10pm on Thursdays and Fridays. Timings for Sundays and Mondays were not announced. The show -- 'Light Up 2018' -- marked UAE's record-breaking entry into the New Year, establishing a new Guinness World Record for the 'largest light and sound show' on a single building, topping the previous standard set in Hong Kong in 2013. 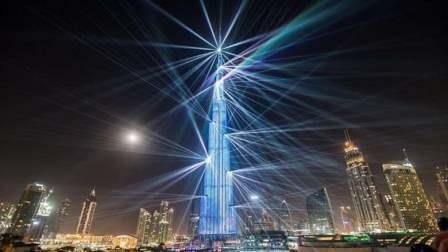 Emaar, the operator of Burj Khalifa and Dubai Mall, had previously announced that the light show would continue until January 6, the first Saturday of the New Year.